Matz's Maxim A conclusion is the place where you got tired of thinking. Watson's Law The reliability of machinery is inversely proportional to the number and significance of any persons watching it. Evan's and Bjorn's Law No matter what goes wrong, there is always somebody who knew it would. Willoughby's Law When you try to prove to someone that a machine won't work, it will. Grogan's Law of supervision The primary responsibility of a supervisor is to discover what his employees are doing- and stop them. Steele's Philosophy Everybody should believe in something- I believe Ill have another drink. Lackland's Laws 1. never be first 2. never be last 3. never volunteer for anything. Vail's Axiom In any human enterprise, work seeks the lowest hierarchical level. Levy's Ninth Law Only God can make a random selection. Oliver's Law of location No matter where you go, there you are! Barth's Distinction There are two types of people: those who divide people into two types, and those who don't. left to themselves, things always go from bad to worse. Since Murphy's extraordinary leap into immortality, many imitators have sought in similar manner to plump the human condition. Perhaps the most successful was British historian C. Northcote Parkinson, who found that work expands to fill the time allotted to it. Next in notoriety is the (Lawrence) Peter Principle, that in every hierarchy each employee tends to rise to his level of incompetence. Lesser known, but just as penetrating, are all the slippery laws of money. For example, there's Parkinson's Second law, which states that expenditures rise to meet income. Further refined by Dunns's Discovery -that the shortest measurable interval of time is the time between the moment you put a little extra aside for a sudden emergency and the arrival of that emergency. This state of affairs is summed up in Gumperson's Law: that after a raise in salary you will have less money at the end of each month, than you had before. With regard to products, Graditor's Laws: (1)If it can break it will, but only after the warranty expires, and (2) a necessary item only goes on sale after you have purchased it at the regular price. To which, add Dyer's Discovery: it's easy to tell when you've got a bargain- it doesn't fit. And Herblock's law: if it's good they'll stop making it. Car owners are well acquainted with Hartmans Automotive laws:(1)Nothing minor ever happens to a car on the weekend, (2)Nothing minor ever happens to a car on a trip, (3)Nothing minor ever happens to a car. Which brings me to Goldwyn's Law of Contracts: a verbal contract isn't worth the paper it's written on. 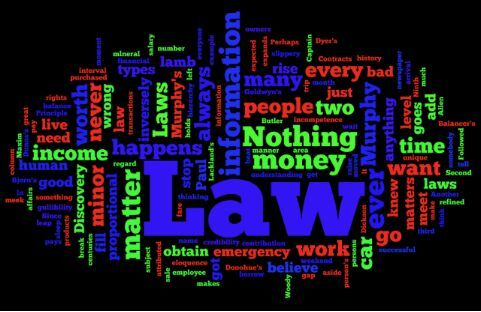 Law-giving actually preceeds Murphy by a good many centuries. Samuel Butler knew that all progress is based on the innate desire of every organism to live beyond its income. Josh Billings similarly admonished: live within your income, even if you have to borrow to do it. Another great name ln the field is Finagle. His unique contribution came in the area of science, but Finagle's Laws on information apply equally to understanding financial transactions: (1)The informatlon you have is not what you want, (2)The information you want is not what you need, (3)The information you need is not what you can obtain, (4)The information you can obtain costs more than you want to pay. The difference between rich and poor is sharply caught by Paul Getty's reminder that the meek shall inherit the earth but not its mlneral rights. Followed by the Golden Rule of the Arts and Sciences: Whoever has the gold, makes the rules. Donohue's Law says that what's worth doing is worth doing for money. And there's Goldfaber's Law, that under any system a few sharpies will beat the rest of us. On pocketbook matters, everyone has to keep his eyes open. Its Gross's Law that when two people meet to decide how to spend a third person's money, fraud will result. As in O'Doyle's Corollary: No matter how many reporters share a cab, and no matter who pays, each puts the full fare on his own expense account. Woody Allen said that the lion shall lie down with the lamb, but the lamb won't get much sleep. To which add Clopton's Law: For every credibility gap there's a gullibllity fill. The Checkbook Balancer's Law holds that in matters of dispute, the bank's balance is always smaller than yours. But if you think the problem is bad now, Epstein adds, just wait until we've solved lt. Finally Quinn's Law: The reader interest generated by any newspaper column is inversely proportional to the importance of its subject. These and others have been collected by Paul Dickson in the book: "The Official Rules".